3D has long been a gimmick to help sell many things. For trading cards, it's a selling point that has been around for a long time in various forms. In the mid-1990s, about a decade before it took a stranglehold on movie theaters, card companies were experimenting with the technology again. 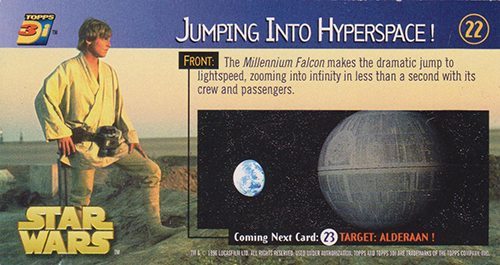 1996 Topps Star Wars 3Di Widevision was intended to be the first of multiple 3D Star Wars sets. Things didn't quite work out that way. 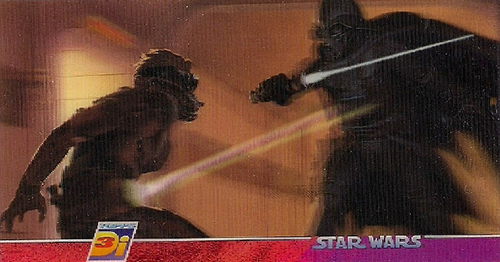 However, like a lot of sets that are under-produced and ignored when first released, 1996 Topps Star Wars 3Di Widevision has held onto its value very well. Today, it's one of the most valuable 1990s base sets for an entertainment release. 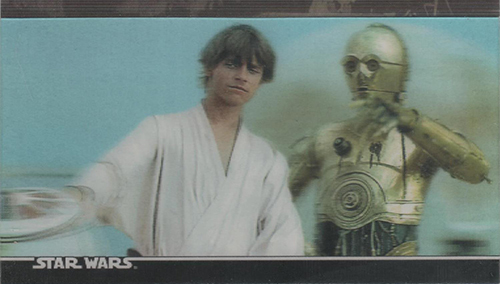 The 1996 Topps Star Wars 3Di Widevision base set consists of 63 cards. Like the regular Widevision set released a year earlier, cards are over-sized, much like the tall boy format. The 3D look is the star as far as design and content. Besides the main image, fronts have a simple ribbon with the Star Wars logo. Card backs have a small writeup, a generic background image and a preview of the next card. These don't show nearly the same depth (pun not intended) as the original Widevision cards that doubled as an extensive behind-the-scenes look at the franchise. Every box has a sample card attached to it. Originally intended for display, every base card has one. These cards hold collectible value as collectors work on their master sets. With the premium format of the base cards, Topps must not have felt the need to do much in the way of inserts. 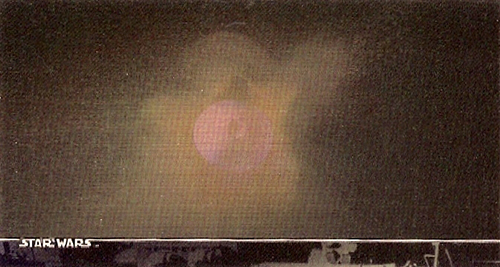 The set has just one, a MultiMotion card showing the Death Star exploding. While promos were made for 3D sets of both The Empire Strikes Back and Return of the Jedi, it wasn't meant to be. ESB was finally made, but more than a decade later. A RotJ 3D Widevision set still hasn't been produced. 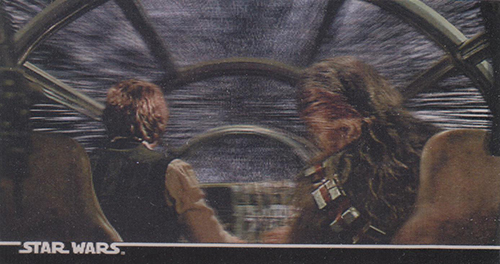 The only other film in the franchise to get a similar treatment was Episode I: The Phantom Menace. Easier to find than this set, it was released in 2000. 43 "I Can't Believe He 's Gone"
45 "Got Him, I Got Him"
Great write up on one of the star collections from the period.While the set was outstanding,the problem was completing the set!This made it even more desirable. 6, 15, 17, 21, 23, 33, 40, 42, 46, 48, 49, 51, 57, 63. I would love to complete the set. I do have a spare 43 and 61. Hi, I have 11 sealed cases of these cards, plus 2 opened cases and several hundred individual loose cards if someone is interested. I was one of the 3 designers that converted these cards into the stereo 3D lenticulars. I converted 33 of the 63 cards personally. That’s why I have so many. Tell me what you need….can we trade? @ lisa: I need #63 and 42 if you want to trade. @all- I have an extra deathstar in motion blowing up as well for trade. Also, for some reason, my cards have somehow gotten a cloudy film on them that can be wiped off with a damp cloth. Has anyone else experienced this with their cards. mine have been packed away since i got them and when I took them out this stuff was on them. Lastly, I have an incomplete set of the ESB cards and some extras if anyone wants to trade. I have #55 – would be willing to let it go for the right offer.